Can be used in Cut-To-Length Applications when fed by a programmable Servo Feed or Air Feed. Mounted on a press, it serves as a scrap cutter or part cutoff. Pneumatically powered, these Stock Cutters are designed to shear material at full width. 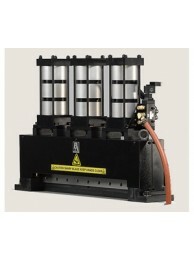 The powerful air cylinders have a pancake profile for High Speed Operations. The Four-Way Solenoid valve controls the sequencing and can be synchronized with a press. Both upper and lower blades are vertically adjustable for wear compensation and sharpening. The lower blade is also horizontally adjustable to provide the correct blade clearance necessary to cut different materials. No other stock cutter has both of these features. Note: Input power is 120 VAC, Single Phase, 50/60 Hz. Other voltages available, 240 VAC, 24 VDC. PSC-6 PNEUMATIC STOCK CUTTER Can be used in cut-to-length applications when fed by a programmable..
PSC-12 PNEUMATIC STOCK CUTTER Can be used in cut-to-length applications when fed by a programmabl..
PSC-24 PNEUMATIC STOCK CUTTER Can be used in cut-to-length applications when fed by a programmabl..
PSC-36 Pneumatic Stock Cutter Can be used in cut-to-length applications when fed by a programmabl..
PSCX-24 PNEUMATIC STOCK CUTTER Can be used in cut-to-length applications when fed by a programmab..
PSCX-36 Pneumatic Stock Cutter Can be used in cut-to-length applications when fed by a programmab..